Thesis. The current capitalist-industrial System is incapable of surmounting the limits to growth on planet Earth because markets and technology, today’s salvation gospel, are no deus ex machina to the energy-and-pollution predicament of industrial civilization. Nor is this System in principle capable of preventing ecological overshoot because growth in physical throughput is the very basis of its existence. As such, we need to transition to an entirely new way of thinking about politics, society, and the economy – Green Communism. This is a system based on technocratic planning using the latest tools of operations research and networking; political control based on ubiquitous 2-way sousveillance to detect corruption and free-riding; and spiritual succor from transcendental values linked to ecotechnic sustainability, instead of today’s shallow materialist values embodied in the System’s “myth of progress”. By repressing the economic potential of eastern Europe and China throughout much of the 20th century, one of Marxism-Leninism’s greatest legacies is to have indirectly postponed humanity’s reckoning with the Earth’s limits to industrial growth in the form of resource depletion and AGW. Had Eastern Europe and Russia become industrialized, consumer nations by the 1950’s-1960’s instead of the 2010’s-2020’s; had China followed the development trajectory of Taiwan; had nations from India to Brazil not excessively indulged in growth-retarding import substitution, it is very likely that today we would already be well on the downward slope of Hubbert’s curve of oil depletion, and burning coal to compensate – in turn reinforcing an already runaway global warming process. Though one might refrain that socialist regimes tended to focus on heavy industries and had a poor environmental record, this pollution tended to be localized (e.g. acid rain over Czechoslovakia, or soot over industrial cities); however, CO2 per capita emissions – which contribute to global warming – from the socialist bloc were substantially lower than in the advanced capitalist nations. Furthermore, it should be noted that the overriding spur to heavy industrialization in the first place was the encirclement by capitalist powers, which created a perceived need for militarization (most prominent in the USSR from the 1930’s, and now North Korea). This process also distorted other aspects of those regimes, e.g. the inevitable throwing aside of universal pretensions (in practice, though not in rhetoric) in favor of nationalism, and what could be called a reversion to the “Asian mode of production” with industrial overtones, which could be used to describe Stalinism, or the militarized neo-feudalism of the Juche system of North Korea. So one cannot point to those countries as “proof” of the superiority of capitalism; to the contrary, we should take away the lesson that any anti-capitalist transition should be universal if it is to survive. Capitalism was a viable and successful system when there was still plentiful land, labor and cheap resources to be exploited (even Engels acknowledged the primacy of nature in powering history’s march forward, for it “supplies [labor] with the material that it converts into wealth”). 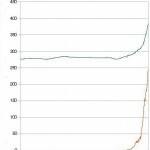 The cheap resources are now ending, so a system predicated on debt-financed perpetual growth is no longer tenable; this became visible in Japan from the early 1990’s, and is now becoming clear in Europe and the US too, where economic collapse in 2008-09 was only checked thanks to a massive transfer of private losses and bad debts onto the public account (socialism for the elites, capitalism for the rest). The neoliberal era underwritten by cheap oil, global finance, and the US Navy is coming to an end. 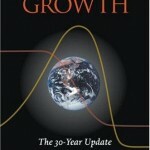 Given that oil production peaked in 2008, and the decreasing EROEI of other energy sources, willingly or not we are going to return to the zero-growth of pre-industrial times: then we can either 1) successfully get out of our overshoot predicament and restart conventional development (unlikely), or 2) we can effect a “sustainable retreat” to lower levels of physical throughput and increased efficiency, or 3) we can with ever more coercive state efforts, with the help of modern cybernetics and electronic technology, use the tools of the industrial era to try to maintain the industrial infrastructure and its associated institutional-cultural superstructure. Most likely we will choose the latter, but it will almost certainly fail; all the Limits to Growth models all suggest that both markets and technology – Mammon and the Machine – are powerless to solve the fundamental predicament that a limited world can support unlimited growth, and they don’t even take further negative feedback loops such as the debilitating effects of political populism and geopolitical competition; nor do those models incorporate the observation that the technological base is dependent on the economic-industrial base for its support, so once the latter fails, technologies from plant bioengineering to energy efficiency also go into retreat. Thus we see the emergence of capitalism’s real contradictions – not so much the impoverishment of the workers (that, too, will come eventually as industrial civilization approaches collapse), but ecology. Throughout the pre- Industrial Revolution era, peasants all over the world have traditionally viewed merchants with suspicion, since capitalism’s profit motive undermined the egalitarian village social relations and support mechanisms necessary to guarantee community survival in a Malthusian world predating modern economic growth (K. Polanyi, 1957). These attitudes will resurge with a vengeance in the coming neo-Malthusian future. Capitalism will have dug its own grave by eating away the basis of its own existence. To avoid collapse, by far the safest route is to kickstart a transition to sustainability – not sustainable development, because it’s far too late for that (we should have started on that during the 1970’s), but sustainable retreat – cutting down on real “living standards” (or at least as measured by the deeply flawed measure of GDP, which counts prisons and environmental cleanup as wealth), to transition to a way of life that is compatible with Gaia. In practice, this will probably imply a transition to a roughly Cuban way of life. 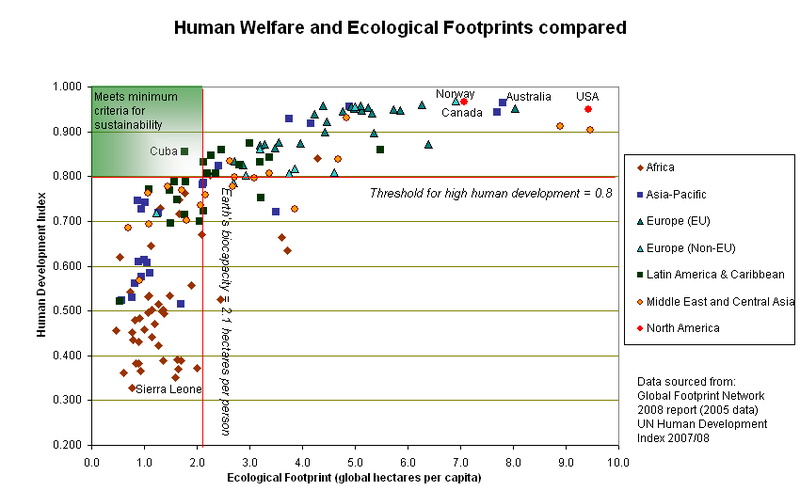 The tropical island is, by one measure (developed level of HDI, low ecological footprint per capita), the world’s only sustainable society. Predictably enough, there will be several heated objections to living like Cubans, but they can all be effectively countered. 1) Poverty. Don’t they try to swim to Florida? Yes, some do. But Cuban poverty is in part the result of US sanctions, and their punishment of foreign companies doing business in Cuba. Furthermore, it is still far more comfortable than any Malthusian-age, pre-industrial society (or any conventional Third World society). The perception of poverty is created by the “international demonstration effect”, in which images of Western consumerism (based on unsustainable exploitation of Gaia) create false needs and frustrations in poorer societies, a false consciousness hoisted upon all humans connected to the System. If the rest of the world embraced the concept of sustainable retreat and accepted Cuba as a valid example, then it will become to look much more attractive as 1) it regains access to leading global technologies technologies and know-how, and 2) because its people will no longer be encouraged to judge success by the standards of how new and how big their SUV’s are, but by their ecological wealth, social harmony, and cultural output. 2) Political repression. Yes, Cuba locks up dissidents and is, in Western terms, an unfree society. However, note that the US has been fighting a decades-long information war against Cuba, that the Western media has an incentive to exaggerate its human rights abuses, and that Cuba’s rulers themselves have to fight against this information war and international demonstration effect to maintain Cuban sovereignty. Given that they are much poorer and less influential, the tools at their disposal are much cruder. Furthermore, as argued by Zizek, the main impact of the communist idea (a secular successor to Christianity’s chiliastic fantasies of salvation) so far was not so much the perfection of the societies acknowledging the idea, as the elucidation of the historical laws (dreams?) by which the perfect society is to appear. It is easy to claim, in a quick pseudo-Marxist way, that such scenes were simply the ideological legitimization of the most brutal terror. However, no matter how manipulative this scene is, no matter how contradicted it was by the arbitrary harshness of the actual “revolutionary justice,” it nonetheless provided the spectators with new ethical standards by which reality is to be measured – the shocking outcome of this exercise of the revolutionary justice, the unexpected resignification of “severity” into severity towards social circumstances and generosity towards people, cannot but produce a sublime effect. In short, what we have here is an exemplary case of what Lacan called the “quilting point [point de capiton],” of an intervention that changes the coordinates of the very field of meaning: instead of pleading for generous tolerance against severe justice, the old Bolshevik redefines the meaning of “severe justice” itself in terms of excessive forgiveness and generosity. Even if this is a deceiving appearance, there is in a sense more truth in this appearance than in the harsh social reality that generated it. We must still undergo a trial, a Great March, of sustainable retreat, at the end of which (due to the elimination of materialist thinking) we will transition into what could be called Green Communism – a sustainable, steady-state human existence founded on the (ever-elusive) reconciliation between freedom and equality. How? 1) The hippies, Green Parties (including Green Party USA), authors of LTG, etc, stress the importance of the grassroots, of Gramscian infiltration, of gradualism – all couched in fluffy, cuddly polar bear-language like “ecological wisdom” or “community-based economics” or “respect for diversity”. The end state is to be a kind of “gift economy”, perhaps in practice encouraged into being through social engineering and widespread psychosomatic therapy. All well and good, but none of this is going to motivate many people to make real change, even in progressive enclaves like the Bay Area (people here mark “Earth Hour” and marginally tone down their CO2 emissions for one hour every 24*365 hours – news flash! it ain’t gonna do much!). Lacking any real drive or force, the elites will ignore these movements at will, and the new Caesars of the coming collapse era will suppress them. 2) The revolutionary extremist road: Alinsky-style activism, propaganda of the deed, catechism of the revolutionist, etc. Problem is that it will not win over the people, and as long as the state remains strong it will take coercive actions against these movements. Unlikely to succeed, but may be the only real chance for change. For capitalism-usury is founded on perpetual growth, by forsaking this tenet the System annihilates itself, so it will not willingly do that. Second, most analysts are either part of, or suborned by, the System – the sum total of the texts and power relations that make up a society’s set of beliefs. The former category, which includes government policy-makers and corporate strategists, suffers from an “institutional myopia” which gives answers in advance and precludes all questions questioning the legitimacy of their own institutions. For instance, what can a rational, capitalist state – interested in self-preservation, predicated on unlimited economic growth, and confronted with irrefutable evidence of the dire consequences of business-as-usual greenhouse emissions on the world’s climate – do to resolve these contradictions? The answers are buzzwords like “green growth”, “skeptical environmentalism”, or geoengineering; the forbidden question relates to the efficacy of industrial capitalism as a system to confront the imminent challenges of man-made climate change. The Gramscian approach of 1) may be doomed by this Bolshevik-Zizek argument that “a political intervention proper does not occur within the coordinates of some underlying global matrix, since what it achieves is precisely the “reshuffling” of this very global matrix”. Yet even if the Revolution is successful, power corrupts; any state formed on the foundations of any such “intervention” may well degenerate into its own nemesis. 3) The laws of history tend to be follow the laws of dialectical materialism – opposites, negation, and transformation – on a route that may lead to a technological singularity, assuming that the ecological base remains intact long enough to sustain the transformation of the industrial System onto a higher plane of existence. The history of the universe is accelerating evolution. A cursory examination of the past reveals growth to be exponential over any sufficiently long period, as can be measured by the frequency of paradigm shifts. Hence, biological life has evolved over a period of billions of years; advanced organisms over several hundred million years. The appearance of intelligent life took place ushered in a technological epoch, which also shows overwhelming evidence of exponential growth – it took ten thousand years from the beginnings of agriculture to catalyse modern economic growth, which has yielded the information revolution in just two hundred years. There are credible prognosesthat posit the appearance of molecular nanotechnology and intelligent machines within the first half of the twenty-first century. There exist patterns to the evolutionary process itself. 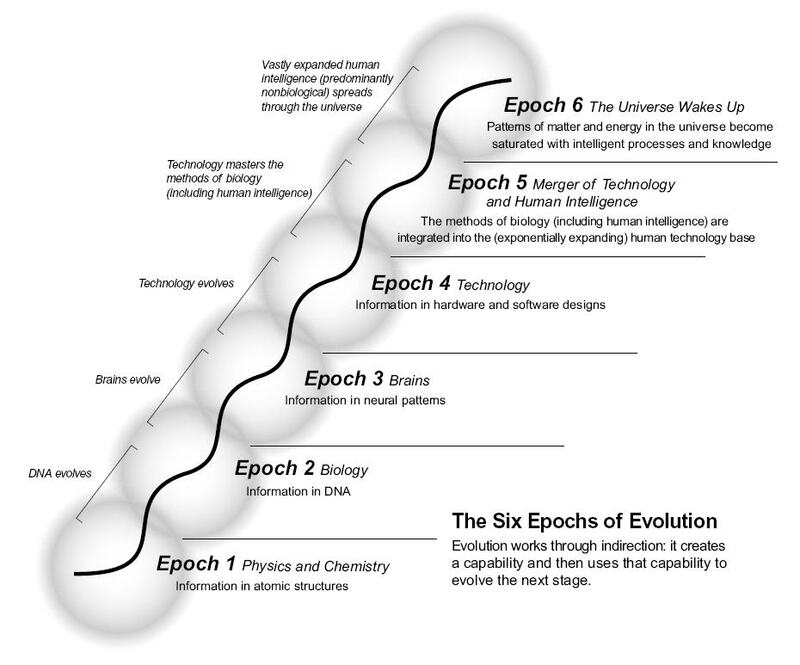 According to futurist-inventor Ray Kurzweil, ‘each stage or epoch uses the information-processing methods of the previous epoch to create the next’. Life emerged due to the chaotic interplay of increasingly complex carbon-based compounds. Its DNA-driven evolution eventually gave rise to agents with information-processing capabilities, which culminated in the human ability to create abstract models of reality within their brains. This capacity to conduct mind experiments created the concepts of technology and machines – the bedrock upon which modern material civilization is built. Futurist pundits, extrapolating current trends in computing, predict the coming of a ‘singularity’ that will result from a merger of human and (exponentially expanding) machine intelligence, leading to a universe saturated with intelligent life. fine-tuned physical constants made life possible, which was born as the biosphere on planet Earth, which lies in a narrow ‘zone of habitability’. The biosphere (or Gaia) took over the geosphere as the primary architect of its own evolutionary path by evolving a feedback system which seeks to optimize the environment for life. Later, technological growth was able to increase the carrying capacity of the land, leading to demographic growth, greater scope for innovation and therefore faster technological growth in a positive feedback cycle. Agriculture permitted the uneven but inexorable coalescence of complex, stratified societies that in the long-run vanquished the biosphere, be it embodied in forests or hunter-gatherers; the world entered the Holocene, in which the environment – land, and increasing air and water – is shaped by the collective will of the noosphere. Basically, networks in evolution build upon each other. A consequence is that later, more complex superstructures, like intelligence, depends for stability on its biological foundations that regulate the geosphere – something we’re putting in jeopardy via environmental damage. If we manage to unleash a technological singularity – and avoid its various perils and pitfalls – then the super-abundance produced by self-assembling nanotechnology will eliminate scarcity, the “dematerialization of production” will make classes obsolete, the borders between reality and virtual reality will fade into oblivion as the Earth metamorphoses into Tlön, modern society’s atoms in the iron cage will become avatars of e-Gods in an electronic cage (like on online forums), based on horizontal networks, instead of the power verticals of today. This form of Green Communism is not of the material, but of the cyber-ethereal. However, the projections suggest that a singularity-driven transition to sustainability may elude us, for both “singularitarians” and “doomers” / “kollapsniks” mostly place their respective events (Singularity or civilizational collapse) in the 2030-50 timeframe. So which trend will win out? Will we “transcend” just as industrial civilization begins to finally collapse? Or will the world’s last research lab be burned down by starving rioters just as the world’s first, and last, strong AI pops into super-consciousness inside? The world is finite, and so the resource stocks and pollution sinks that sustain industrial civilization (“the System”) are limited. We have been in a state of “overshoot”, beyond the “carrying capacity” of the Earth, since the 1980’s (The Limits to Growth, 2004). Limited resources have been drawn down much faster than they could be replenished, and the Earth’s pollution sinks have been overfilled much faster than they could be regenerated. Based on paleoclimate reconstructions of CO2 levels, an eventual global warming of above 2C is already inevitable. This will set off a cascade of climatic disasters that will speed up the rate of warming, leading to the desertification of much of the world’s land and oceans, the drying of the great Asian rivers, and massive inundations of the low-lying coasts and deltas that harbor humanity’s heartlands. States will collapse into anarchy, spawning Biblical-scale famines and floods of climate refugees. Meanwhile, the energetic resources that power the System will be coming under severe strain. Oil production has already peaked, and natural gas and coal will follow in a few more decades. The remaining resources are much harder to extract, since the easiest pickings have already been exploited. We will have to divert ever more energy, labor, and capital towards mitigating the effects of both energy depletion (renewables, remote hydrocarbons) and runaway climate change (adaptation, geoengineering). This will starve agriculture and the consumer sector, ushering in disillusionment, social discontent, and a longing for a strong hand at the helm of power. This will undermine liberal democracy’s political legitimacy, leading either to anarchy (“failed states”) or increasing coercion (authoritarianism). Geopolitical rivalries over the remaining energy resources will intensify, extinguishing the already dim prospects for international cooperation. Long-term thinking will recede into irrelevance, for political leaders will have their hands full with much more pressing issues – building sea walls, feeding the military, and placating (or dispersing) angry mobs. Our only way to escape this trap is to rapidly effect a global transition towards “sustainable development”. The imperative of such a transition was recognized as early as the 1970’s, but we have yet to see any truly meaningful action. Nor are we likely to, since the defining feature of industrial-capitalist civilization is indefinite growth, based around the taking of loans against (higher) future returns. There’s a reason why Malthusian societies suppressed usury – and should we continue business-as-usual, we will soon rediscover why. Though the System is very effective in some ways, it cannot foresee its own demise; nor can its servants even ask questions that hint at the unpalatable answer. However, the casual, detached, and informed observer can. Yes, in a purely technical sense, disaster can still be averted if one could convince people to make, or more likely force through, drastic reductions in First World overconsumption, a full-scale retooling of the industrial system towards renewables and recycling, and a global system of “contraction and convergence” on CO2 emissions. Achieving this, however, is unlikely in the extreme; any transition to sustainability is going to be stymied by social myopia and geopolitical anarchy, as well as innate human psychological features such as the conservative bias, the denial complex, hedonism, and susceptibility to “creeping normalcy” and “landscape amnesia”. 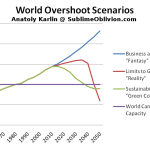 Unless we overcome these failings, or discover a technological silver bullet, we will collide with planetary limits to growth sometime around 2030 to 2050. In that scenario, the System as a whole will become increasingly fragile, such that a large enough perturbation – say, a major war or global climatic disaster – will send it into a self-reinforcing spiral down into chaos. The electrical-industrial infrastructure supporting modern technology, especially the massive repositories of information entombed within cyberspace, will crumble away into oblivion. After a short period of unprecedented violence, famine, pestilence, and death known as “the Collapse”, the world will get larger once more, and society will retreat back into the comforting blackness of a new Dark Age. Faced with these grim prospects, we see it fitting to launch a multi-pronged initiative to if not avert a Collapse (as is the purpose of the global Green movement), then at least to attempt to mitigate, as best we can, its catastrophic humanitarian consequences. We do not wish on the demise of technological civilization, for we recognize that for all its ecological obliviousness and social injustices, it has enabled tremendous progress in science and many aspects of culture and human welfare. That said, we recognize that sometimes, the Second Law of Thermodynamics – the tendency for all closed, complex systems to decay – cannot be sidestepped. use the remaining high-EROEI fossil fuel stocks in a crash program to build as large a nuclear and renewable energy infrastructure as possible. clean up radioactive and toxic installations while we still have the technologies and resources to do so. work on fostering global unity and a common human identity to encourage cooperation and discourage competition and resource wars. preserve as much as possible of the world’s stock of technologies, bioresources, and knowledge in dispersed repositories (“lifeboats”) in durable, physical format. retool the education system to disseminate practical skills and democratize it using the power of the Internet (as long as it continues to exist). 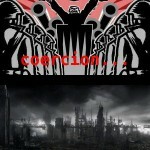 promote communal-agrarian values, while ditching the individualist and accumulative mentality that is spelling our doom. unite all social groups under different wings of the Party – conventional Greens, as well as socialists, feminists, right-wing survivalists, etc – that are amenable to the kollapsnik message. eschew militarism, dismantle overseas military bases, and repatriate the troops; but maintain a minimal nuclear deterrent. nationalization and / or regulation of the commanding heights of the economy to optimize resource conservation and pollution control. establish a network of self-contained “resiliencies” across the nation and the world, modeled on the Kibbutzim, that will provide physical, mental, and spiritual nourishment to those who need it. allow mostly-unimpeded free enterprise for small, non-strategic, and low-material throughput businesses, for it will still be necessary to keep the consumerist urgings satiated. the Party is to be aim to operate on a horizontal and democratic basis, in which promotion and honors are to be based on the judgments of peers on one’s competence and commitment to the cause. the winding-down of the prison-industrial complex in a controlled manner; the nature of law and order to be determined in further internal debate. general debt amnesty to wipe the slate clean and start from Year Zero in our quest for sustainability. expand resources into research on areas such as sustainable energy, geoengineering, and artificial intelligence to increase the chances of achieving a technological “silver bullet”.